While soldiers of the Army National Guard, the descendents of colonial and state militias, have played less of a direct combat role in the Army’s most recent conflicts, National Guard units have served proudly and with great distinction in America’s wars. After its formal organization in the early 1900s, the National Guard formed a substantial amount of America’s fighting forces in World War I, World War II, and the Korean War. Among the many Guard units who served the nation during this period was the Wyoming Army National Guard’s 300th Field Artillery, which earned two Presidential Unit Citations for combat actions in Korea. First organized in 1888 before Wyoming became a state as the 1st Regiment, Wyoming National Guard, the regiment was redesignated the 1st Regiment Infantry, Wyoming National Guard in 1890. Shortly after the U.S. declared war on Spain in April 1898, the regiment was mustered into federal service as the 1st Battalion, Wyoming Infantry. The battalion participated in the capture of Manila and remained in the Philippines to take part in the Philippine Insurrection. On 23 September 1899, the battalion returned to San Francisco, California, and was mustered out of federal service. In 1903, the unit was reorganized as the 2d Regiment Infantry, Wyoming National Guard. After the U.S. entered World War I on the side of the Allies, the 3d Regiment was drafted into federal service on 5 August 1917, but in the following months, it was broken up and its elements spread throughout the 41st Division. These elements went on to participate in five campaigns (Champagne-Marne, Aisne-Marne, St. Mihiel, Meuse-Argonne, and Champagne 1918) on the Western Front. In 1920, the former 3d Regiment was reorganized as the 1st Cavalry, Wyoming National Guard and later redesignated as the 115th Cavalry Regiment in 1922. As global tensions grew, the regiment was inducted into federal service in February 1941. After the U.S. declared war on the Axis powers in December 1941, the 115th was reorganized and redesignated as the 115th Cavalry Regiment, Mechanized, but it was broken up on 1 January 1944 and its elements organized into various other units. One of these elements, the 98th Chemical Mortar Battalion, saw action in New Guinea, the Bismarck Archipelago, and on Luzon in the Pacific Theater. After the war, the 115th Cavalry Squadron, Mechanized, was converted and reorganized as the 300th Armored Field Artillery Battalion with its headquarters at Sheridan, Wyoming. 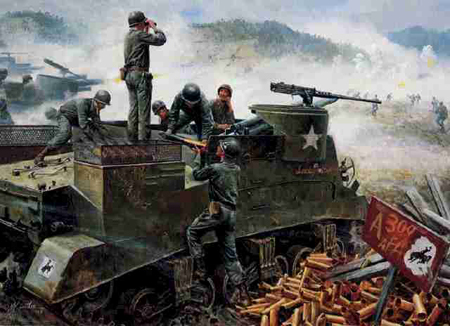 With the outbreak of war in Korea in June 1950, dozens of National Guard units were ordered into federal service. On 19 August 1950, the 300th received orders that it was to be activated. The battalion was soon on its way to Fort Lewis, Washington, its ranks augmented by reservists, regulars, and draftees. Commanded by LTC John F. Raper, Jr., and equipped with M-7 self-propelled 105mm howitzers, the 300th underwent several months of training at Fort Lewis. In December 1950, the battalion was named Outstanding Artillery Battalion by the Sixth Army Combat Readiness Evaluation inspection team. On 23 January 1951, the 300th left for Korea aboard the USNS General M.C. Meigs. Upon arriving at Pusan on 15 February, the battalion was assigned to the Eighth Army and underwent further training. On 15 May, the 300th conducted its first fire mission against the enemy in support of the 2d Infantry Division around Soyang. In heavy fighting that lasted over a week, the 300th fought valiantly against an onslaught of twelve Chinese divisions. In one twenty-four period, A and C Batteries fired 7,200 rounds. For its actions around Soyang and Hongchon, the 300th earned its first Presidential Unit Citation. The 300th remained in Korea for the remainder of the war, taking part in battles at the Punchbowl, Bunker Hill, Bloody Ridge, and Heartbreak Ridge. In the final weeks of the conflict, the 300th earned a second Presidential Unit Citation for actions at Kumsong. In all, the 300th fired 514,036 105mm howitzer rounds in 805 days of combat. The soldiers of the 300th earned 12 Silver Stars, 63 Bronze Stars, and numerous other medals. In addition to two Presidential Unit Citations, the battalion also earned a Meritorious Unit Citation and two Republic of Korea Presidential Unit Citations. Eight soldiers from the 300th were killed-in-action and another 175 wounded. In 1959, the 300th was consolidated with two other armored field artillery battalions into the 49th Field Artillery under the Combat Arms Regimental System. In 1996, the 49th was reorganized and redesignated as the 300th Field Artillery. Today the 2d Battalion, 300th Field Artillery, equipped with M198 towed howitzers and headquartered at Sheridan, traces its lineage back to the early days of the Wyoming National Guard.